Confidence is great, but overconfidence and overestimating ones own skill set is not. We aren’t toddlers, growing so fast that you need to buy a suit 2 sizes up. It is important to fly an appropriate sized suit for your skill set, not where your skill set will grow into. There are two very important reasons why it is important to adhere to the appropriate progression; number one is safety, number two is that it is the fastest way to the end goal which is to be a competent and skilled flyer. Let’s start off by going over why the most efficient way to get better is by learning on smaller suits, then relate it to safety because they really go hand in hand. I’ve said it before, wingsuits are amplifiers. They amplify all of the right moves, giving you more power, and all of your wrong moves. You might think your body configuration is on point, arm wings neutral and not dihedral, not arching, but the reality is that it’s probably not as good as you think. What you “feel” and what is actually going on is probably much akin to the beginner tracker swearing their legs are straight but they aren’t. 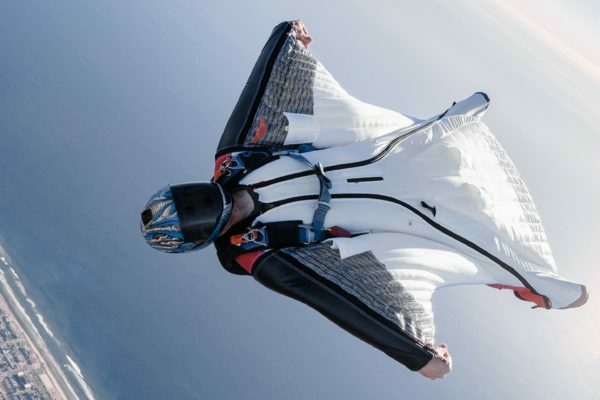 There is a lot more air resistance when you add a wingsuit to your skydive than you are used to. It takes practice to learn to associate what you are feeling with what is really going on. Get a qualified instructor to video debrief your flight. 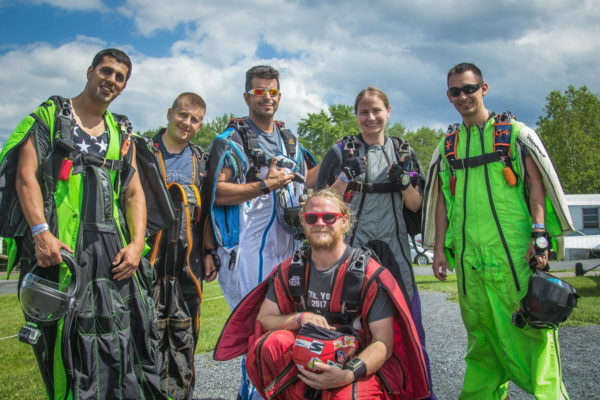 Learning to fly through the full range of a suit, flying in a slot, a range of angles and speed changes, being aware of the people around you, approaching a formation safely and efficiently, impeccable deployment sequences, perfect exits – all of these should be done well prior to upsizing suits. If you upsize prematurely, you are only making all of these skills more difficult to preform and control by adding even more surface area. Some people feel pressured by ego and peers to be on a larger suit. No one worth impressing is actually impressed by what suit you fly. It is far more impressive to see good decision making and flying an appropriate suit. Besides, everyone is going to know as soon as they are in the air with you that you should not be on that bigger suit. And now we talk about safety. It is not cool to be jumping a suit that you aren’t in absolute control of with people. It’s dangerous. Tumbling an exit potentially going through other flyers, out of control approaches to formations, not realizing how much closing speed and power you have and slowing down too late, overshooting approaches and having to correct back the other way, overpowered side slides…the closing speeds reached in wingsuits can be fatal. It is not something to take lightly. Check your ego. Why would you put a suit on that endangers other people? If you’re trying to look cool, you’re doing quite the opposite. Trust the progression. Fly an appropriate sized suit and don’t skip steps. Ultimately you will be a competent and skilled flyer sooner, and you won’t endanger yourself and your friends.